In the halcyon days of one’s childhood, some parents lavish their offspring with elaborate birthday parties. These may include a magician or a clown to entertain the kiddies, or some form of age-appropriate game to keep the little ones occupied, like pin the tail on the donkey or even a colorful piñata to take a swipe at. And potentially evoking a youthful nostalgia for these celebrations are the stunningly executed Piñata Dunny pieces, the newest handmade works by Mexican artist Shiffa. More than an anonymous artistic alias, Shiffa is a mononym employed in all his professional endeavors. With a real name that is reportedly a bit too complicated for everyone to pronounce, this Chilango artist’s unique character designs typically depict humor through creatively conceived situations, ones that are memorably uncomfortable or unusual. Sculpturally rendering his illustrative voice onto factory-produced vinyl forms, Kidrobot’s popular Dunny being a perennial favorite, his hand-modified and painted designer toy pieces have been impressing aficionados since his debut within the movement in 2013. Obviously influenced by the surreal animated programming he grew up loving, such as John Kricfalusi‘s The Ren & Stimpy Show and Stephen Hillenburg‘s SpongeBob SquarePants, Shiffa’s deceptively simple looking works embody his acute attention to detail within their polished, cartoonish appearance. Meticulously wrapped in slitted garlands of vibrantly colored tissue paper, Shiffa’s Piñata Dunny pieces visually transform the hardness of their production vinyl form’s base into something that appears delicately beautiful. Finished with specially sculpted facial detailing, each one uniquely modeled by the artist’s hand, these conceptual creations are each accompanied by a randomly colored “gummy dunny” treat, a merging of the gummy bear and Dunny profiles. With these being representative of the candy that piñatas traditionally contain, though cast in crystal resin and thus non-edible, several of these “gummy dunny” innards are spilling forth from “breaks” in the bruised eye adorned Broken Piñata Dunny variation’s shell. With each of these roughly 3-inch tall Piñata Dunny pieces also being accompanied by a colorfully decorated piñata stick and a certificate of authenticity, these stunning sculptures aren’t being handmade in a set edition size but rather are being made-to-order for a limited time period. Additionally offering an approximately 8-inch tall rendition of the Broken Piñata Dunny form that includes upscaled accessories, such as the double-sized “gummy dunny” castings, Shiffa’s nostalgia-inducing creations may look like disposable celebratory items but each is a true work of imaginative art. 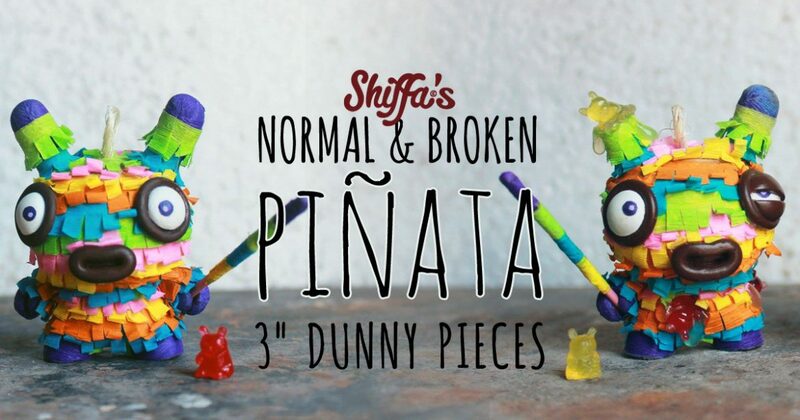 Click Here to Contact Shiffa and Reserve one or more Pinata Dunny pieces before July 29th, 2018.